An important trait that all great leaders have is respect. They understand that respect is earned, and that they must treat people on their team with the same respect that they themselves expect. Leaders must recognize that each member of the team brings something of value to the table, and find a way of releasing the talent and innovation in the team through honest personal behavior and open communication. A misconception that those new to leadership roles often have is that they think they need to have all the answers to every problem or challenge. Nothing could be further from the truth. Great leaders actively solicit opinions, listen, and leverage the knowledge of the entire team in order to make their final decisions, and when making that final decision, ensure that the reasons for choosing one path over the others is explained in detail to the team. Many believe that true leadership talent emerges when you are losing, not when you are winning. Your team will sometimes make wrong decisions, and as the leader, you will sometimes be perceived to fail. It is during those times that true leadership is needed. Lift the team up, ready them for the next challenge, and thank them all for giving their best. We all have our ups and downs; some days are better than others. In spite of this, leaders must be consistent in words and actions. Sometimes it will be tough, but that is what true leadership is about - the ability to overcome adversity and drive forward. A leader should look to their chain of command and constantly ask their leaders how they can improve. The leader should also solicit direct feedback from the team they lead in order to find opportunities for improvement in different angles. Improvement can also be team focused, looking for ways in which the team can improve as an operating unit, or how processes that the team applies in the execution of their work can be improved. Team members react more positively to the recognition of their contribution to a team than to any other type of recognition and reward. This is partly why Lean was so successfully applied in Japan. Japanese workers recognize and respect their role as part of a team more so than their Western counterparts. However, this is beginning to change and team building and team events to help with team building are becoming more commonplace in the West. 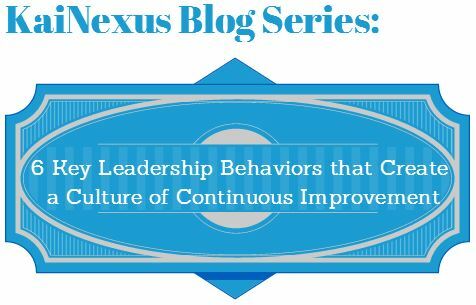 Spread continuous improvement with KaiNexus. Let's get to work.